[Jesus said to Peter,] "I tell you the truth, when you were young, you were able to do as you liked; you dressed yourself and went wherever you wanted to go. But when you are old, you will stretch out your hands, and others will dress you and take you where you don't want to go." Jesus said this to let him know by what kind of death he would glorify God. Then Jesus told him, "Follow me." There was a time when Peter thought he was ready for anything. He wasn't. Jesus told him so. Peter argued with Jesus. Jesus was right, of course. But Peter had been humbled by his own failure and then realized that the course of discipleship begins with humility. He was ready to follow, even if his path would lead to his own death in a way similar to Jesus' death. In fact, Jesus let Peter know that his future was directly tied to the crucifixion of his Lord. 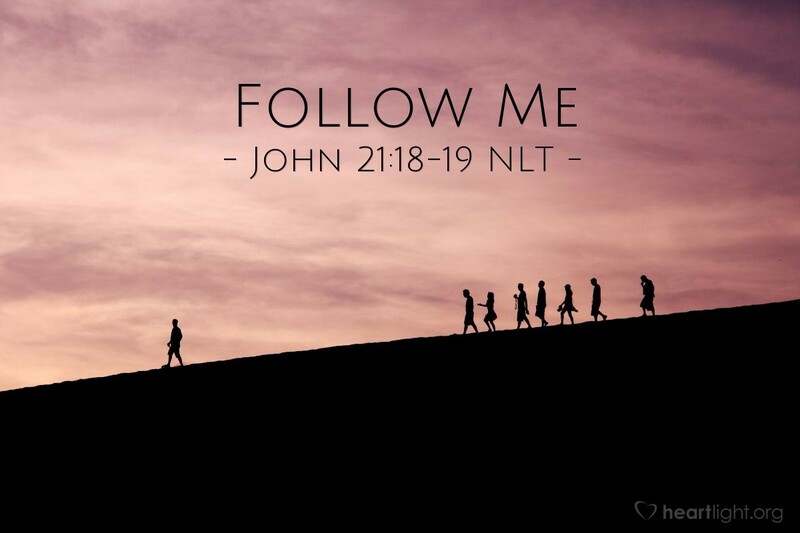 Yet Jesus still said to him, "Follow me!" You and I don't know exactly what the future holds, but Jesus looks at us and asks us to follow, even if it means a cross. Let's follow! Give me courage and strength, O God, so that I can follow Jesus no matter what challenges, difficulties, or hardships come my way. Please, never ever let me outlive my love for your Son or for you. In Jesus' name, I pray. Amen.